It's been really long that we have had a giveaway at Diva Likes. Organizing giveaway is fun and a way to thank all our readers who have been visiting Diva Likes time and again. We have been thinking a lot about this giveaway from quite some time and here we are! This time the fun has doubled as we have collaborated with CouponzGuru who is our sponsor for this wonderful giveaway. You all know about CouponzGuru as the website which offers best deals and coupons for all the leading shopping websites. 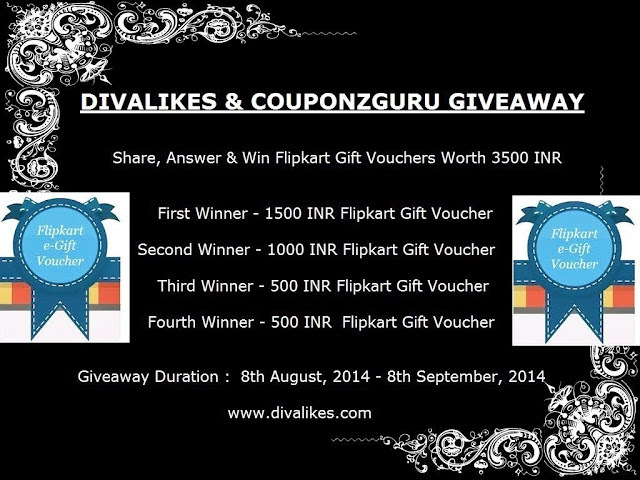 So here they are presenting FlipKart vouchers worth 3500 INR to 4 lucky winners at Diva Likes. Yes, you heard it right! There will be 4 winners. All you have to do is fulfill the giveaway rules and stand a chance to become a winner! Share the giveaway link on your facebook page along with the picture and tag 5 of your friends. Do tag Diva Likes as well so that we can check. Each time you tag 5 friends you get 5 points. So tag as many as you can. Do not forget to leave the shared link in the comments below for us to consider your entry. You get 5 points for each share. Leave a comment below mentioning "Which is your favorite online shopping website and why it is your favorite?" Try to give a significant and interesting answer. You get 5 points for your answer. First Winner will be selected based on the maximum shares on facebook. Second Winner will be selected based on the best reply for the question "Which is your favorite online shopping website and why it is your favorite?" Third and fourth winners will be randomly selected via random.org. Your entry will be only considered based on the comment you leave here in the comments section below. This giveaway is open to everyone with valid id proof. The giveaway starts on 8th August,2014 and ends on 8th September,2014 11:59 PM IST. Winners will be declared shortly thereafter. Wishing all of you good luck! hey.. a great giveaway this is.. I love to shop online..It is so much convenient to shop from your home and get stuffs at your door step without any tension. My fav online sites are homeshop18,amazon,flipkart.. I love their customer service and delivery.Everytime i get my stuffs on the due date and very safely..It is so much fun to shop online..right? thankss for this wonderful Giveaway. 2. They have super fast delivery service which works even on Sundays! 1. It puts an end to my search for wide variety of products that I wish to buy. know that today it will be delivered so we make sure that some one stays home. 4. Replacement policy: Once I ordered Anarkali suit from them and wasn't satisfied with it and immediately called their customer support and they arranged reverse pick up and delivery of replacement product and they actually listen to their customer which I love the most. 6. Wide range of products: love this site as it has wide range of products from clothes, footwear, home accessories, torches, everything that u can think of and u need to buy. Flipkart is the best & my most favorite online shopping website. They have wide range of product of my choice from electronics, beauty,cloths, upto kitchen & home appliances. Also flipkart offer us various discounts & offers which makes shopping budget management & we can shop a lot. Delivery of the product is good, they give us tracking details as(item is packed on the same day,product is now reached at banglore warehouse next day), the product will reach you within 4 days. Sometimes it can take 1 or 2 days only & you will get surprised to get your dreamed product at your door step. I had spent my INR 50000 /- upto now for my flipkart purchases & each time I'm happy. They also allow you to exchange or return of the product received if you are not satisfied with the product purchase & also allow total refund for the product even if it costs INR 100 /- & it is too directly in your bank account. Even you can purchase the products seeing the reviews just below product description, even you can review the product too. What one can expect to have happy doorstep delivery of purchase? Flipkart do it in real. Flipkart is my favorite online shopping website because their delivery is so fast. Each I order an item, they send me the delivery date and name of the person who will deliver it. They ensure safe delivery of products. Also Flipkart has so many retailers. Hence they have a wide range of items. They have lots of amazing combo offers & discounts. So I personally love Flipkart.com and its my all-time favorite site. Also their packing is very good. My favourite online shopping website is Flipkart because 1. Good quality product 2. fast delivery time 3. collection of product.& last but not least.very good return policy & customer care. Flipkart does not pride in personal touch or boast of lowest prices. It gives off an undeniable sense of efficiency. It is like a large humming machine that you have come to trust. I have used Flipkart 4-5 times in last six months and every time it is the same unerring, predictable but pleasant experience. I hope all the talk about its operational losses is crap and the business continues to stay float. I like to shop on Flipkart , this is my fav online shopping website. I like the prompt service which they provides and the way they interact with the customers. Flipkart provides stylish, irresistible & charming range of products. I like Flipcart .com . Its Really a awesome site . Its products are really super duper and nice, branded and amzing. I like flipcart.com . Its really nice products, branded and super duper . Its amazing site. no tension for go out side . Best online shopping site. I like flipkart .com for my online shoping because . They have super fast delivery service which works even on Sundays! --> It offer a wide range of products at a reasonable price. --> It has a quick home delivery service. --> The transaction is as easy as it could have ever be with options like COD, free return policy, 30 day replacement guarantee,etc. --> Customer Care is available 24*7 all round the year to address the customers' grievances. --> It offers Clearance Sale everyday under "Deals of the Day" section. --> A Student Club has been made for College students where it provides exclusive discounts and offers for those students. In short,Flipkart caters to the need of ecah of my family member and therefore, its my best online shopping site. My best shopping website is Flipkart.com which is the ultimate "Gateway Shopping of India" for online shopping. I love to shop because of their wide range of products, affordable prices, swift delivery with excellent customer support is the hallmark of Flipkart. 3) Wide range of products. -> It is one of the biggest shopping website where i can find a variety of stuff . -> Delivery of products is fast, reliable and secure. -> COD method as well as Online payment gateway makes it secure and reliable. Truly speaking I buy everything from flipkart but when it cums to buy jewellery I go for sammydress as It has awsom collection and quite cheap compared to even Indian jewellery brand. And quite good designer rings u can buy, so one of my favorite is this too. Flipkart is my favourite e-commerce and online shopping site. Because they sale 100% genuine products where others sale fake and defective products by their sub-sellers. Flipkart's own WS Retail is the best to offer 100% genuine products and their e-Kart is fastest delivery provider. I am in love with Flipkart shopping! My favorite online shopping site is Flipkart. Becoz genuine & affordable product of all brands available here.Fast delivery & alert through messages I love that.All required product I can purchase here, its a megastore , all family members together find favorite products at one site & do shopping. * Good free return policy. * Every flipkart purchased item i got every time with free useful gift. So flipkart is My Favorite. I am proud be a flipkart buyer..
My favorite online shopping website is Flipkar Faster delivery,Every flipkart purchased item i got every time with free useful gift. flipkart.com because they are best at everything. sales, return and customer support.Hats off to you. Flipkart is the best & my most favorite online shopping website. They have wide range of product of my choice from electronics, beauty,cloths, upto kitchen & home appliances. Also flipkart offer us various discounts & offers which makes shopping budget management & we can shop a lot. Delivery of the product is good, they give us tracking details as(item is packed on the same day,product is now reached at banglore warehouse next day), the product will reach you within 4 days. Because Flipkart is a No 1 online shopping in India, best prices and a completely hassle-free experience and pay you Cash on Delivery, Debit Card, Credit Card and Net Banking with secure and trusted gateways. Now shop through Flipkart books, apparel, footwear, lifestyle accessories, baby care products, toys, posters, sports and fitness, mobile phones, laptops, cameras, movies, music, health and beauty, televisions, refrigerators, air-conditioners, washing machines, MP3 players and more categories available. My favorite online shopping website is Flipkart.com because all the product they listed will have discounted rate. You cannot see such huge discount on any other shopping sites. This is one of the best website for online shopping in India. I highly recommend you to check this website before you shop on offline stores or any online sites. They do have an Cash on delivery option, so you don’t need to worry about payment related issues. You can pay for the product when you receive it. *Easy return and Exchange policy. Flipkart is my favorite & trusted online shopping website. I can shop from top brands with multiple product categories & it offers best prices. It gives me easy & hassle free shopping experience with options of paying through Cash on Delivery & Online through secure gateways with easy EMI options. I can shop whenever I want as it gives 24/7 shopping experience with an ease of price & products comparison & get delivered at my doorstep. It gives clear information before I buy with confirmation of the orders & allows cancellation and refund. I can shop for my favorite books, mobile phones, laptops, cameras, music, health and beauty, televisions, refrigerators this list is unending & cool lifestyle accessories, apparel and footwear brands featured on Flipkart with expert descriptions help me to arrive at the right buying decision. Their order tracking, delivery timing & customer support is awesome, the moment I place order I get email & SMS about tracking details of my order. Flipkart is a perfect shopping website in India with the awesome products & wonderful shopping experience. Flipkart is my favorite shopping site. Flipkart is a name of trust for online shoppers. There are multiple product categories which cover all the things to shop, books, mobile phones, laptops, cameras, music, health and beauty, televisions & many more. It has the best delivery system with superb packaging, genuine products and prices and also offers good deals and discounts. With Fipkart, I don’t need to Flip to any other online shopping website. Flipkart is really awesome, products are 100% genuine , return policy is there, even they have a button to return the product on their website, we can take our money back & the customer care is also superb… once you call and with the number that is registered on Flipkart, they will automatically call you by your name and their polite behaviour to talk… they try to solve your problem immediately. Their tag line suits them “Flipkart pe jo dikhta hai, wohi bikta hai”. Its name should be “AWESOMEKART”.